Will ecommerce kill off retail in the CEE region? According to Colliers International latest Logistics&Retail research report “Survival of the fittest”, the answer to the above question is no. There is room for online and conventional channel retail to continue co-existing side by side in the short to medium term in the CEE-6 markets. The solid further EUR 71.5bn expansion of retail sales out to 2022E, 4.9% growth per annum overall, creates enough evolutionary room for multiple concepts to continue thriving. 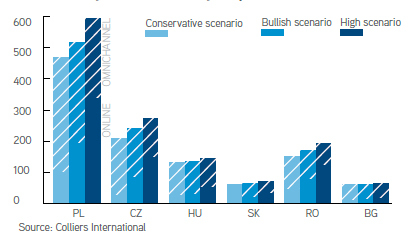 Conservative growth scenario sees ecommerce in CEE-6 expanding 8.8% per annum from a baseline of EUR 13.1bn, to EUR 20bn. “We acknowledge that bullish estimates may put the size of the online market closer to that mark even today. But even in a more “bullish” scenario of ecommerce capturing 10% of all retail sales by 2022E, expanding to EUR 34bn, we foresee a decent majority of incremental sales still occurring through the traditional, established channels”, explains Mark Robinson, CEE Research Specialist, Colliers International. Is there space to expand? The baseline expansion of demand via online channels and products delivered will generate, according to our calculations, a requirement for 198,000 sqm of dedicated logistics/warehouse distribution space per annum in CEE in 2018-22E, if the assumption is made that present capacity is fully-utilised. This compares to the supply chain for conventional retail in the period requiring 865,000 sqm of logistics/distribution space per annum to service increased sales. At what stage of evolution is ecommerce? Ecommerce is playing a full part in the fast growth of the service sector in the CEE-6 countries. But the amorphous nature of the rapid growth of online sales makes precise estimation tricky. To obtain consistency, we have adopted the Statista estimates for market size in 2017 and their projections forward to 2022 that were published in their 2018 study. The Statista study was based on a model cast (in US dollar terms) using extensive surveying of 13 European countries (including Poland) and others around the world. The 2017 market size in CEE-6 using Statista’s assumptions is EUR 13.1bn. Other sources see the market size in the CEE region much higher but taking the highest estimates in each market would sum the CEE-6’s market size in 2017 to EUR 20.1bn. We set the Statista data against retail sales in the CEE-6 and across Europe as a test of these estimates and to attempt to assess the opportunity for future growth prospects. The Statista 2017 market sizes plot below a linear line of best fit in Romania, Czechia and especially Poland. How fast will ecommerce grow? Using projections from Statista, we believe that total ecommerce revenues in the CEE-6 as a baseline conservative scenario will grow 9% per annum by 2022. We expect the region’s 3.1%-5.6% 2017 Statista data range of ratios to total retail sales should expand to at least 3.7%-6.9% by 2022, totalling a minimum of EUR 20bn in revenues and increasing by more than EUR 6.9bn. The combined 1.063mn sqm of space required in our conservative baseline 9% expansion of ecommerce within 4.9% overall retail sales growth equates to 3.3% of present modelled logistics/ distribution stock in the CEE-6. But more interestingly equates to 62% of Q2 2018’s active construction figures and 87% of modelled take-up for the last 4 calendar quarters. “Tenants from the ecommerce sector still remain one of the most active groups on the industrial market in Poland. Agreements concluded by ecommerce companies accounted for over 15% of the demand in Poland in the first half of 2018. They are most likely to locate their warehouses along the western border of Poland, from where they can efficiently serve the markets of Western Europe and Central Poland”, says Maciej Chmielewski, Senior Partner and Director of Industrial and Logistics Agency at Colliers International. It is in the scenarios of higher proportions of retail sales being online that additional logistics/distribution capacity will be required. For ecommerce, we model a sales per sqm ratio about half that of conventional/omnichannel retailers. This difference generates an absolute terms requirement for space of an average of an extra 107,000 sqm per annum in our “bullish” scenario in 2022E, where the share of ecommerce is just over 10%. 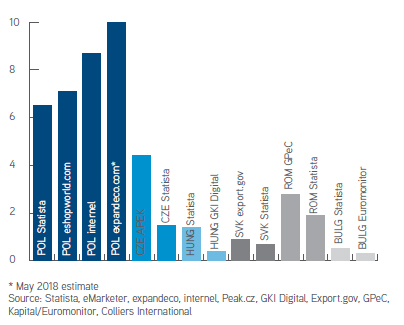 In our ambitious “high” scenario, where ecommerce rises to 13.2% of retail sales on average across the CEE-6, the extra space required would be 263,000sqm. Our “conservative” scenario’s EUR 6.9bn online retailing increment takes a 10% chunk out of the overall projected growth in retail sales of EUR 71.5bn in 2018-22E. The extreme scenario of ecommerce absorbing all retail sales growth from now to 2022E looks out of scope. 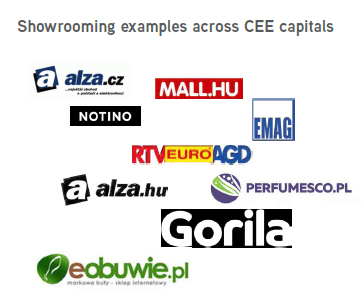 It would imply online sales rising to 19%-29% of retail sales across CEE-6. The UK’s level is 15.2% now. Our “bullish” scenario implies EUR 34bn of online sales, absorbing 20% of all retail sales growth by then. Important is that 80% of incremental sales would be omnichannel/traditional. So even taking inflation into account, there is demand coming via these channels. So, should any closures of retail units occur? Probably not, overall. We have detected none yet. Assessing the CEE-6 capital cities’ Q2 2018 TSC retail space per capita against their 2015 GDP per capita suggests slightly overbuilt situations, or room to absorb higher sales. How will retail rents develop? We do not see retail rents firming in the face of our modelled ecommerce expansion. Negotiations and agreements on turnover rents and recognition of online sales are going to be required. But neither do we see large rent reductions, as the CEE-6 omnichannel/ traditional increment is still worth at least EUR 27bn between 2018E-22E in our “high” scenario. A potential survival aid, the “showrooming” phenomenon, is spreading in CEE-6 (excepting Bulgaria), now accompanying and flagging the growth of ecommerce. Some of the largest e-electronics and e-fashion & cosmetics players have already established pick-up point presence in well-located offices and at transport nodes in the larger cities (see below for details).